I worked on Melicent a little bit. I kitted the new Loose Feathers pattern. I'm thinking of using 40 ct. V. Pecan Butter (shown) or 40 ct. Examplar. My goodness you've certainly been busy! Melicent looks gorgeous! Millicent is lovely! Love the colors for the new LF! I looove the colors for the model! Can't wait to see what it is! Very exciting pics!!! As always! Love your blog so! Okay, like seriously, oh my gosh. I can't WAIT to see the model, because I love those colors!! Your WIP is gorgeous, and love the floss toss for the LF! Such pretty pieces and the colors are to die for! Yummy! 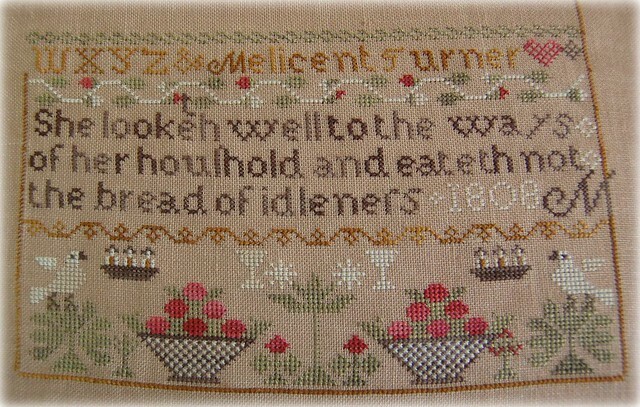 Millicent is such a sweet sampler. 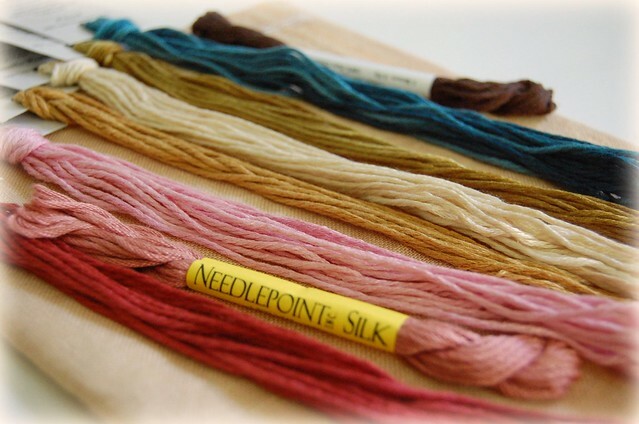 Love the colors for your new project and I can't wait to see the new model you'll be stitching. The color palette is wonderful. YOu are so bad!!!! Just new this would be a pic of a new (well...newer) start. Melicent is coming along beautifully!! What a lovely finish! Love your fabric choice for the new LF. Those floss colours look wonderful with it. Love your progress on Mellicent! Melicent is gorgeous. I love how she's turning out. And isn't the new Loose Feathers pretty? Oooh, can't wait to see that model - the colors are lovely! Melicent is awesome! It's progressing so nicely and the colors are wonderful. Millicent is really pretty and love the colors in the new project you kitted up. You always show the lovliest things! Isn't Millicent pretty?! The colors are beautiful, as are the colors for the model! I think that's the first non-shop photo I've seen of Vintage Pecan Butter. Pretty looks great with your threads. Melicent is so pretty!!! Don't you love the new Loose Feather???? Oh, Nicole, I am loving all of the color you have going on! And that's my favorite designer, too. ;) I can't wait to see! The sampler is so beautiful, and I would wait for your BBD photos very much - wonderful colours! Beautiful! 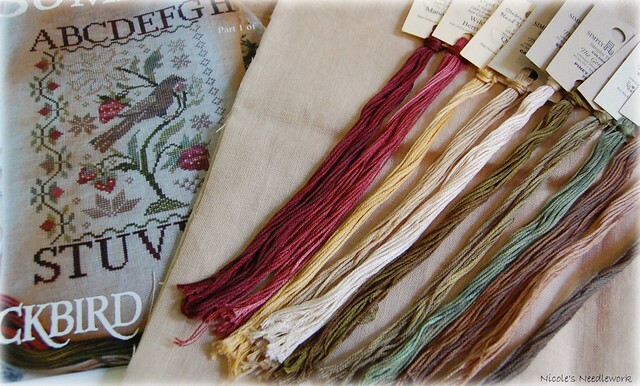 I just love the look of the antique samplers. Are there any books or magazine subscriptions you would recommend for more inspiration? Keep up the fantastic work! Me ident is coming along nicely!